The Father Purcell Memorial Exceptional Children’s Center (FPM) is a skilled pediatric nursing home for 58 developmentally disabled children. It serves children throughout the U.S. of all races and creeds, providing custodial care, medical treatment and rehabilitation programs. The mission of FPM is to provide a residential care program to developmentally disabled children, their families and the larger community without regard to race, color, religion, nationality or socioeconomic status. We exist to serve the nursing, medical, physical and psychological needs of children who, because of severe developmental disabilities, require ongoing residential care in a skilled nursing facility. 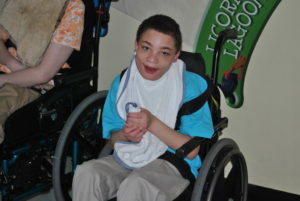 Our goal is to help each child living at our facility reach their potential and live their life to the fullest. We also strive to serve as an inviting and supportive resource for families.